Kickin’ Cancer is back in action April 26 – 28 at Cool Sports! Registration is open until April 5! 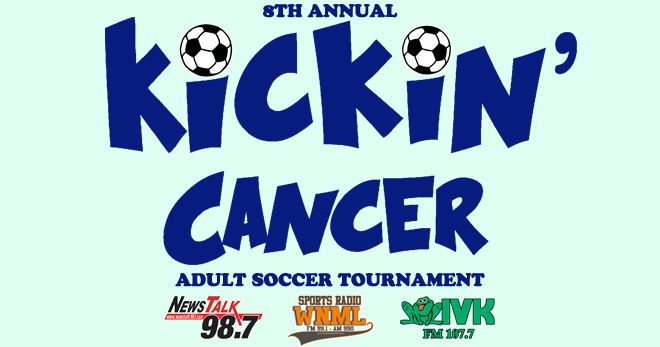 Kickin’ Cancer is an adult indoor soccer tournament for all levels of adult soccer that raises money for members of our community battling cancer. Join a team today to help kick cancer in the grass! The tournament will be held April 26 – 28 at Cool Sports located at 110 S Watt Rd, Knoxville, TN. Help raise money for friends of the soccer community suffering from cancer. Last year Kickin’ Cancer raised over $13,000 for two members of our community and would love to be able to do the same this year. There are three divisions – open (all 18+ and very competitive), B (men over 30+ and women 18+ and still competitive), and recreational (men 30+ and women 18+ of lower skill levels). All games are 30 minutes, 4 men on the field and 2 women. Each team is guaranteed 3 games and rosters are limited to 12 people. Everyone receives a super soft tournament shirt that will be their jersey for the tournament, as well as a swag bag filled with goodies from our sponsors. It’s a really fun weekend of food, beer, soccer, and items that will be available up for auction!